The national conversation about sustainability usually includes topics like renewable energy, recycling, and carbon emissions. 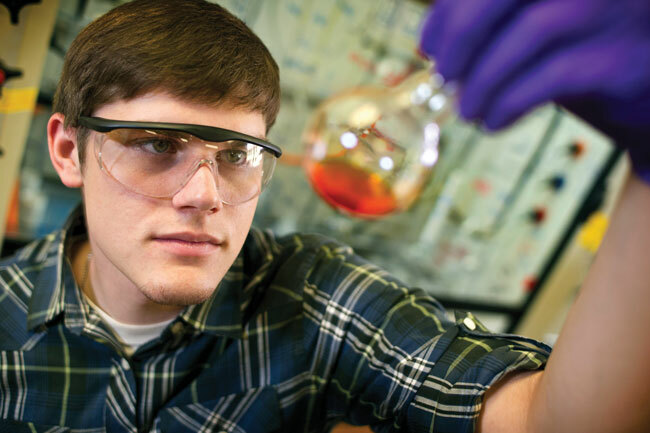 But when biochemistry senior John Gurak talks about sustainability, his focus is something else entirely: flavin catalysis. Flavin catalysis is an environmentally friendly way of producing heterocyclic compounds, or heterocycles. While heterocycles are used in many fields, including pharmaceutical development and light-emitting diode manufacturing, the traditional chemical processes that produce them demand a lot of energy and have significant environmental impact. Flavin catalysis offers a metal-free alternative, as it operates at room temperature and uses air as fuel. Gurak is currently working with Frank Foss, assistant professor of chemistry and biochemistry, on adapting riboflavin as a catalyst in the production of heterocycles. Their work falls into the area of “green chemistry,” an emerging field that seeks to reduce or eliminate the use and production of hazardous substances in chemistry. For his research, Gurak was one of 33 scholars nationwide to be awarded a Greater Research Opportunities Fellowship from the U.S. Environmental Protection Agency’s (EPA) Center for Environmental Research. He also interned at an EPA lab over the summer.